What do I need to use the Flood Tool? A modern Internet browser supporting Adobe Flash Player 10 or higher. Adobe Flash Player version 10 or higher installed and working properly. Address or location of interest to search. What is the source of the information presented in the Flood Tool? The flood hazard zones and other flood features are derived from FEMA flood mapping products, including Effective Digital Flood Insurance Rate Map (DFIRM) overlays extracted from the National Flood Hazard Layer (NFHL) or downloaded from the Map Service Center, Preliminary DFIRM overlays provided by FEMA, and older Q3 digital flood data overlays obtained from FEMA and extracted from Arc/INFO coverages. Advisory Flood Height and flood depth values come from HEC-RAS-based Zone A delineation models developed by a FEMA contractor. Elevation values are taken from the USGS National Elevation Dataset (NED). Risk MAP information comes from LEVEL I HAZUS runs acquired by the WV Department of Homeland Security and Emergency Management (WVDHSEM), mitigation group. Okay, I found my address/house/property and clicked on it to get flood information. What do I do now? The next steps you take will depend on your results. 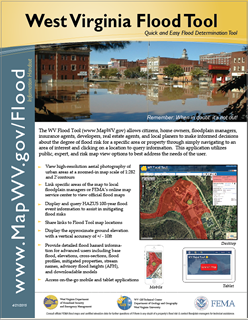 If you have any questions about the results or wish to find more information, you may want to contact the floodplain administrator for your county or community, or the WV State Coordinator's office for the National Flood Insurance Program (NFIP). The Coordinator's office staff are knowledgeable regarding the Flood Tool, flood maps and flood insurance requirements.